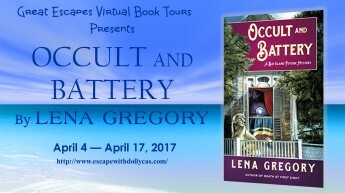 Occult and Battery is now one of my favorite cozy mystery books ever! … it’s the author who keeps my attention going with her intriguing storylines and interesting characters. It’s fast-paced, she never misses a beat. The mystery was well written and the killer threw me for a loop. This series just became an auto-buy for me which is pretty impressive considering it’s the first book I’ve read by Lena Gregory. It was an absolute delight. The author gives us plenty of suspects as well as some twists so it was hard for me to figure out who was the murderer. This cozy was fast-paced and I didn’t want to put it down once I started. I had a lot of fun reading this mystery and I have this series on my must-read list. 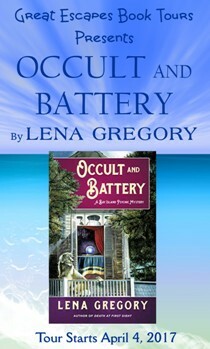 This is a well-written cozy with a touch of paranormal (and a hint of romance). I especially liked the author’s writing style. This was a well written book that had a great plot and kept me interested. I am not sure if I believe in fortune-telling and séances, but it was fun to read about them. 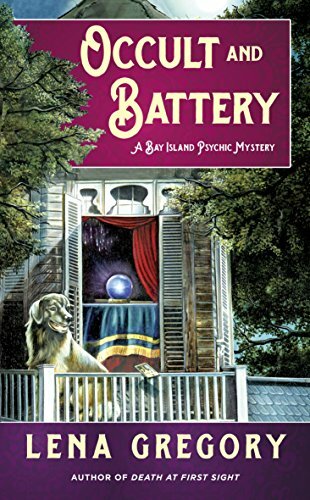 Occult & Battery is an entertaining cozy murder mystery that will easily engage you to join Cass in her latest psychic mystery adventures! Really like the psychic aspect in this book. Sounds like a fascinating read. I went to Lena’s release party & had such a good time! Thanks for the review & for hosting the give-a-way Lori! I have not read any of Lena’s books, but am looking forward to one. This sounds great! Mysteries are always fun! This book sounds wonderful! I love the title!